If you’ve never seen the movie Walk the Line (2005), then you are missing out on a great film! 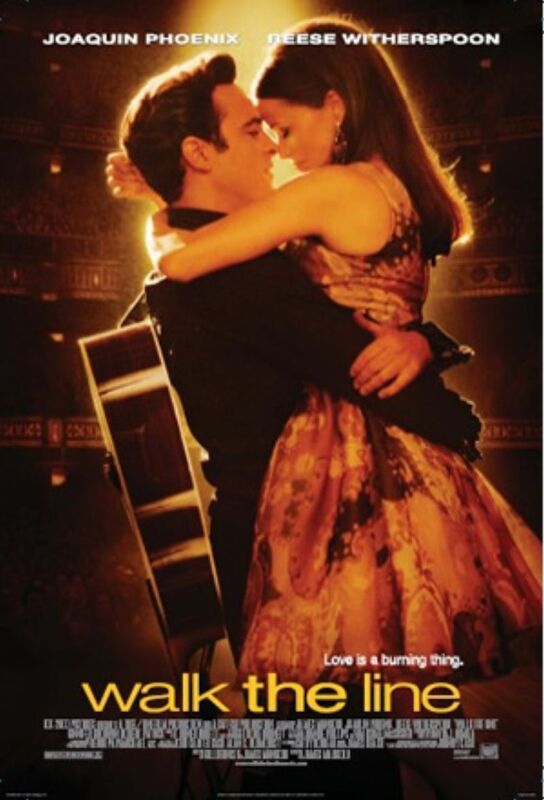 It portrays the famous love story of Johnny Cash and June Carter. Joaquin Phoenix (Johnny) and Reese Witherspoon (June) are superb actors and even do their own singing throughout the film. The movie really focuses on Johnny’s life and career, as well as his struggle and recovery from drug addiction. However, the love he shares with June is one of the main themes of the film. If you ever watch one of those old Billy Graham crusades on TV, then you most likely will get to hear a performance by Johnny Cash and his wife, June. One night as I was flipping through TV channels, the unmistakable edge of Johnny Cash’s voice signing a hymn caught my attention. After listening to his duet with June, I listened to his message. Johnny talked a lot about his struggle with drug abuse and addiction, and he also gave a sweet yet powerful testimony of how June helped him through it. I wish I remembered what episode I had seen, but I remember Johnny saying that he would never have gotten over his addiction if it were not for God. He also said that his relationship with June would never had been saved if it were not for God’s help. This really touched me. Although Johnny and June’s relationship started out rocky, in the end they stayed together and weathered through life’s storms. If you have ever been in a difficult relationship, then you know how impossible that may seem to be. Johnny and June chose commitment over convenience. They chose their marriage and their faith in God over what the world had to offer. Sure it took them quite a while, but in the end they worked it all out. And the Lord surely did bless their marriage and helped them to inspire people around the world. In fact, when June died in 2003, Johnny passed away only a few months after. I love how when Johnny proposes to June in the movie (spoiler alert! ), he says, “you’re my best friend. Marry me.” They were a couple who had more than just feelings of love or lust. What Johnny and June had was commitment and an undying loyalty to each other. They were best friends. They rescued each other. They loved each other through the bad times. This is exactly how God feels about us. He loves us and wants to be loved by us. He has chosen us from the very start, and he wants you to know that He is your friend. Even when your world is falling apart, you can always count on Jesus to be there in the midst of it all. The world isn’t easy. Sin and evil have corrupted almost everything–except for the truth and love of the Almighty God. They are not of the world, just as I am not of the world. Sanctify them by Your truth. Your word is truth (John 17:16-17 NKJV). Sometimes as Christians, it can feel like we are “walking a line” in order to make God happy and to do the right thing. But what happens when we veer off that straight and narrow path? What happens when we screw things up? No matter how hard we fall, whether it be to addiction, lust, doubt, or any other sin–God will always love us and forgive us. He has made a way for us to know Him and His goodness. Jesus wants you to surrender to Him, not so He can condemn you and make you feel bad, but in order for Him to free you from the chains of your old broken life. [Just] as He chose us in Him before the foundation of the world, that we should be holy and without blame before Him in love, having predestined us to adoption as sons by Jesus Christ to Himself, according to the good pleasure of His will, to the praise of the glory of His grace, by which He made us accepted in the Beloved (Ephesians 1:4-6 NKJV).